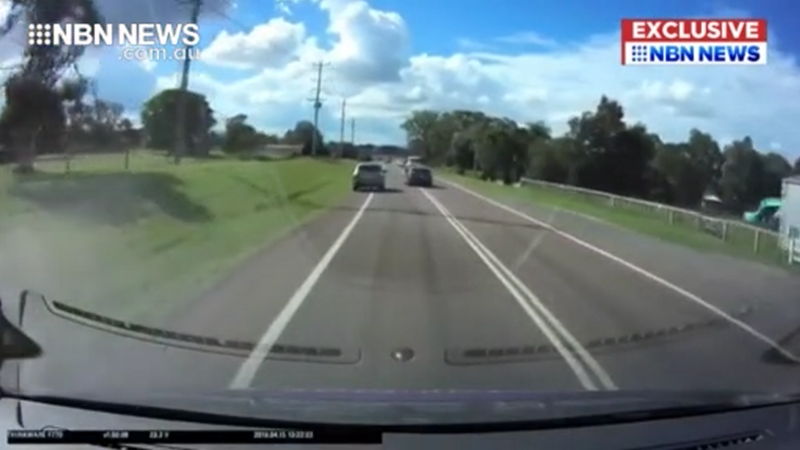 A car’s onboard cameras today captured some breathtakingly dangerous driving in the Hunter Valley. A dark sedan can be seen overtaking traffic on the wrong side of the road, across unbroken lines, forcing oncoming cars into the breakdown lane. It then weaves to the inside to narrowly avoid a head-on. Thankfully other drivers sense the danger and help avert disaster. A police car roars into view, on the stretch of Cessnock Road between Gillieston Heights and Maitland, then breaks off the chase. The offending car seemingly blends into traffic, and is gone.